Why do I need to get health insurance if I'm 31? If you've hit your 31st birthday, you may be wondering why everyone from your mum to your accountant might be speaking to you about taking out private health insurance. Not to mention the advertisements from health insurers and letters from Medicare! It's all to do with the Federal Government's Lifetime Health Cover (LHC) loading. The LHC loading was put in place to encourage Australians to take out private hospital cover earlier in life and maintain their cover. How it works is that, although private health insurance is optional, if you don't have an appropriate level of cover by June 30 after you turn 31, and later decide to take out hospital cover, you'll pay an extra 2% on top of your private hospital premium for each year you put it off. 2% doesn't sound like much but, doing the math, if you wait until you're 40 to get hospital cover you'll have to pay 20% more than someone on the same cover who first joined when they were 30. And what makes it worse still is that you'll be stuck with your loading for 10 years, even if you change health insurers. In some cases, special circumstances or exemptions may apply, and you should check this carefully. For example, if you've recently turned 31 while travelling overseas, you may have a little extra time up your sleeve to take out private hospital cover without incurring LHC loading; 12 months from the day you landed back home is the general rule. Check out our 'Are you 31?' 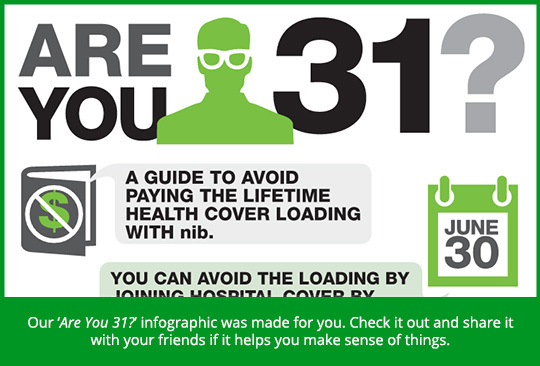 infographic, read up on more Lifetime Health Cover loading information or visit the government's privatehealth.gov.au website.